"Princessa" Antique Brown Jeweled Chandelier 25" x 18"
Home > Lighting > Chandeliers > Chandelier "Princessa" Antique Brown Jeweled - 18" x 25" - 4 Lights! If you're trying to find a happy medium between something dark and masculine enough but also a little frilly with crystals, look no futher. This magnificent hanging lamp strikes that delicate balance perfectly. Our "Princessa" brown metal hanging lamp has nicely faceted real glass crystals hanging from it's metal arms. There are four 25watt max lights which is plenty to give off a beautiful glow. The chandelier comes with a very long cord and matching metal chain with a plug on the end, but it also comes with the hardwire kit and a second hanging installation style. So no matter your preference: Hanging this directly from an existing light box in the ceiling (electrician or handywoman required! ), or plugging it in and swagging the chain, you're totally covered with this one purchase. 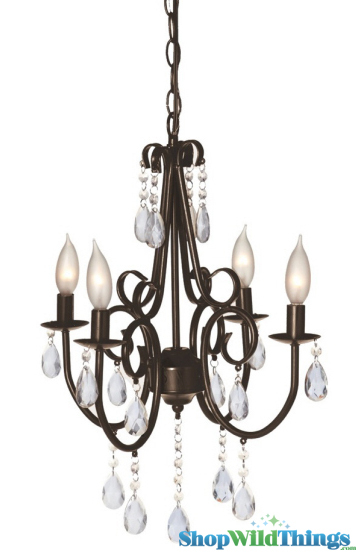 Chandelier dimensions: 25" X 15.5" X 17.5"
Chandelier "Princessa" Antique Brown Jeweled - 18" x 25" - 4 Lights!